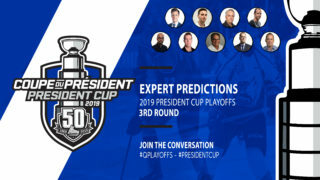 After a hard-fought battle during the regular season, a pair of Maritime Division rivals will now face off during the first round of the 2019 President Cup Playoffs. The Charlottetown Islanders will host the Cape Breton Screaming Eagles in the first game of this series on Friday night. 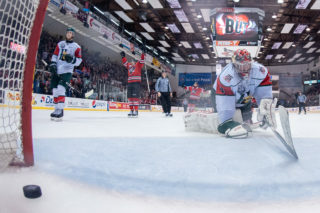 The Islanders, boosted by a shootout victory over the Halifax Mooseheads on the final day of the regular season, finished fourth in the tightly contested Eastern Conference with a record of 40-21-4-3 and 87 points. The Screaming Eagles landed in fifth place with 86 points and a 40-22-1-5 record. 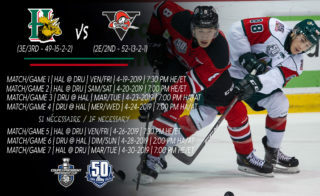 Both teams finished the regular season strong, with Charlottetown going 8-2 in their last ten and Cape Breton finishing 7-2-1-0 during that same span. 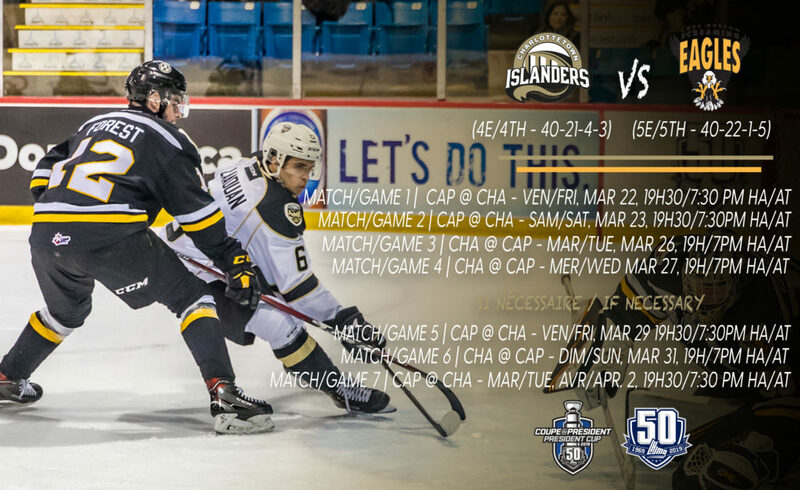 The Islanders are coming off back-to-back QMJHL Semi-Final appearances. 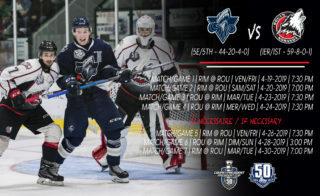 Last year they took the 2018 Jean-Rougeau Champion Blainville-Boisbriand Armada to seven games in a highly entertaining third round series. It’s been a case of making up for lost time in Charlottetown. After going 11 years between playoff series victories, the Islanders have emerged from the first round in each of the last four years, the only team in the league that can boast of such an accomplishment. The Screaming Eagles are making their sixth consecutive appearance in the President Cup Playoffs. The team was defeated by the Drummondville Voltigeurs in a five-game, first round series last spring. The Eagles’ last foray past round one occurred in 2017 when they were swept at the hands of the Islanders in the league Quarter Finals, the only previous playoff meeting between these two clubs. No two teams facing off in the first round of this year’s postseason have seen as much of each other as the Isles and Eagles did during the regular campaign. 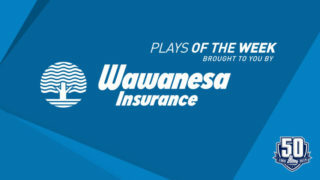 Over the course of nine games, Charlottetown eked out a narrow 5-4 season series win. The last of these meetings took place on March 9th, a 3-1 Islanders victory at home that saw center Zachary Beauregard net the game-winner while adding an assist and netminder Matthew Welsh turn aside 28 shots for the win. The last Eagles victory in the season series occurred on January 26th, also in Charlottetown, when Mitchell Balmas’ second goal of the game, a shorthanded marker, proved to be the difference in a 4-3 Cape Breton triumph. The Islanders were led offensively by a pair of veterans in winger Daniel Hardie (78 points) and center Nikita Alexandrov (61 points), while Anaheim Ducks prospect Hunter Drew led the blueline with 50 points in 61 games, good for eighth among all QMJHL rearguards. 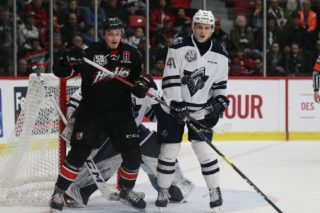 2018 QMJHL first rounder Lukas Cormier delivered in his sixteen-year-old season with 36 points, second among rookie defensemen in the “Q”. In nets, fourth-year veteran Welsh was his typical solid self, going 32-19-2-3 with a 2.90 GAA, .902% save percentage and three shutouts. The Eagles were led by hometown hero Balmas. Acquired from Acadie-Bathurst in the off-season, the overager capped off his final regular season in the QMJHL with a career high 43 goals and 82 points. Fellow forward Mathias Laferriere enjoyed a breakout season with 74 points in 62 games, while the European duo of winger Egor Sokolov and defenseman Leon Gawanke each recorded 57 points. Appearing in a career high 50 games, goaltender Kevin Mandolese made the most of the opportunity, registering 29 wins, a 2.87 GAA and three shutouts. One of the key words to describe this series would have to be “familiarity”. On top of facing each other nine times during the regular season, three members of the Screaming Eagles and one Islander have spent time in the other squad’s lineup, including Eagles winger Derek Gentile and Isles blueliner Noah Laaouan, who were dealt straight up for one another last December. Then there’s the head coaches from each side, as Jim Hulton (Charlottetown) and Marc-André Dumont (Cape Breton) joined forces at the 2019 IIHF World Junior Hockey Championship as members of the Team Canada coaching staff. Finally, both teams will be looking to vanquish history – not to mention each other – on the road to playoff glory. Curiously, this is the lone first round series that involves two teams that have never appeared in the President Cup Final.